Just as Baylor is attempting to distance itself from the sexual assault scandal that rocked the athletic department this spring, there’s an unrelated incident further damaging the football program. 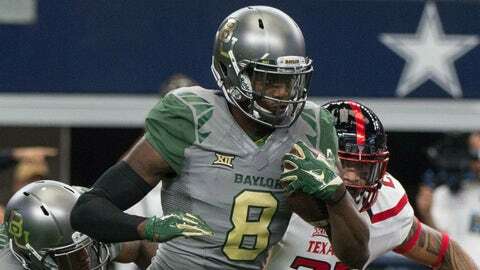 A video has surfaced that shows Bears wide receiver Ishmael Zamora abusing his dog in June. After a fellow Baylor student saw the video on Snapchat and went to the authorities, Zamora was charged with a Class C misdemeanor and faces up to a $500 fine. Zamora also will be disciplined by the university. KXXV-TV in Waco obtained the video, which is graphic and can be seen here. "I lost my temper trying to discipline him," Zamora told KXXV. "I’ve been through training with a dog trainer to help me learn new potty training tips." After the incident, Zamora sent the dog to live with relatives in Houston. Zamora caught nine passes for 132 yards and two scores last season and could start in 2016.